4hairloss.org was excited to be one of the first authorized distributors for More Hair Naturally 9. This product was researched and designed by More Hair Naturally. They are the U.S. manufacturer and distributor of Italian based Kevis 8, More Hair Naturally 8, and other related hair loss products. The makers of this product make some bold claims on its success. They say this product is so fundamentally more advanced than anything else on the market. The editors at 4hairloss.org want to test these claims. We are looking for men and women, in all stages of hair loss to try this product for at least 3 months and allow us to monitor your results by keeping in contact with us and allowing us to guide your progress. The reason for the bold claims is the power of the four key ingredients. Each has been studied to some degree and offered in Europe and Asia as a viable hair loss remedy. Kevis and More Hair Naturally have taken these four ingredients that are successful treatments in Europe, in their own right, and have combined them at the same recommended strength as in European tests to create More Hair Naturally 9. The editors at 4hairloss.org are super excited to test this product on themselves and monitor the results of our clients. This product holds huge potential. The four key ingredients are Redensyl, Stem Cells, Capixyl, and Baicapil. Below is a quick definition of each, but we encourage you to also view each case study that is provided. You can also do a Google search on each of the four main ingredients. Stem cells are now a major focus in the medical field because of their amazing applications, but research on hair follicle stem cells is more recent. Redensyl is a major step in this research because this product activates the hair follicle stem cells and manages their function to induce the production of new hair. More research is underway and needs to be done, but research so far suggests that these hair follicle stem cells play a crucial role in stimulating the growth cycle and using Redensyl encourages it. More Hair Naturally 9 is using adipose-derived stems cells, mountain ginseng, and bamboo sprout stem cells as a means to promote hair growth. These are considered to be the most potent and effective stem cells for thinning hair. Using different forms of stem cells is very limited in the U.S. due to laws and regulations, but in other countries stem cell research continues to grow and its uses for disease continues to amaze. Using stems cells for hair loss is just one of many uses. More attention to using stem cells for hair loss is being researched and small studies being performed. Initial conclusions show that stem cells may be a highly effective treatment for hair loss. Capixyl is a biomimetic peptide combined with a red clover extract. This product is a powerful nonprescription means of preventing the 5-a-reductase process of converting testosterone to DHT, which is the main cause of hair loss. Doing this prevents hair miniaturization and the hair anchor stays strong and no damage from inflammation. More studies need to be done but initial results show that it is a very strong inhibitor of DHT. Baicapil is a combination of three plant extracts that are known agents to fight hair loss. This innovative ingredient stimulates hair growth by effecting the growth phase a hair follicle cycles through. It actually decreases the shedding and resting phase and increases the growth phase. This effect increases the length and thickness of the hair itself and the density of hair on the scalp. This product can be used by men and women. In addition, they claim the ingredients in this product have been shown to work on the entire scalp, including the hairline. Included with your purchase is 4hairloss.org’s custom protocol and instructions based on our research of the ingredients and how to most effectively use and apply the product. We are very interested in monitoring your results if you decide to try the product. This is just an informal study that we do on all the products we start selling. We have a special interest in this product because it represents a potential next generation product for hair loss. It is definitely a new direction compared to what drug based medicine provides. The use of stem cells is a forward thinking mentality. We want to know how this product works and what the experience is on it and we need your help to do it. There is no compensation for participating and you do have to buy the product. 4hairloss.org assumes no responsibility for your participation; it is completely voluntarily on your part. However, we hope that you will communicate with us while on the product so we can monitor and guide your progress and help when you want/need it. My experience and opinion on this product: I like this product and I love the company. In creating this product, they did a ton of research in coming up with the combination of ingredients that this product offers. The product also has a great consistency, it completely dries on the hair and scalp and even though it sometimes leaves a slight residue, you can remove it pretty easily. However, I do have a few comments to make about the product. One, I tested/used the product very aggressively for 4 months and didn’t get any results. However I have numerous clients who use it regularly. Two, it can be an expensive treatment because while using it I would go through one bottle about every 3 weeks (that adds up if you are on a tight budget). Three, I question how effective the stem cells are. I have been doing research and testing on stem cells and feel I am getting close to the right protocol for using stem cells and what stem cells to use. There is no real research on applying stem cells topically because I believe this product is a first for stem cells being applied topically. All of my testing of stems cells has been injected with a needle. My research suggests that you can’t expose stems cells to the natural environment or even the air we breathe without some type of preservation additive. That is why the MHN 9 bottle is vacuum sealed to prevent that exposure to the environment prior to application. 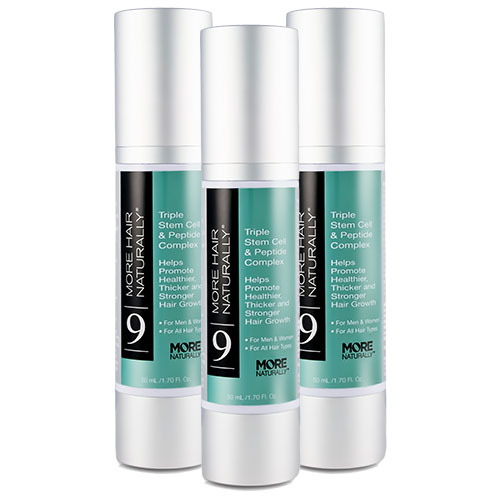 If my product (4hairlossMen & 4hairlossWomen) doesn’t work for you, or if you can’t use my product for whatever reason, then MHN 9 is definitely a good product to try. Price is for 3 bottles/90-day supply of More Hair Naturally 9.